> Is the Mazda3 ready for a facelift? Is the Mazda3 ready for a facelift? 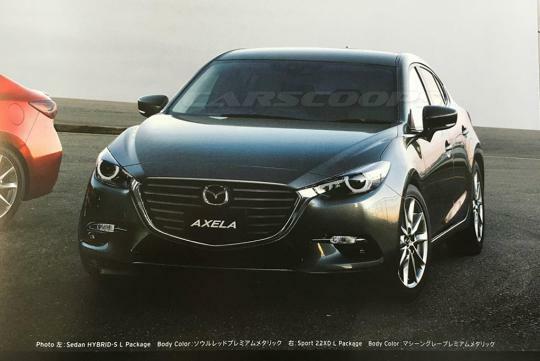 According to Carscoops, a photo of the facelifted Mazda Axela which is otherwise known as the Mazda3, has been leaked. Given that the Mazda3 was launched near the end of 2013, the time is now ripe for a mid-cycle update. As one can see from the photo, the changes to the car looks minimal, with the front of the car receiving a redesigned grill and repositioned logo. The bumper also gets a little refreshing with the signal lights/fog lights being relocated to the air vent area. The exterior mirrors now spot turning signals too. No other details of the car's rear were revealed but judging from how subtle the facelift is, it is safe to expect minimal changes to the rear end too. Just like the Lancer Ex 1.5, it will be good if the Mz3 1.5 could be 'stroked' to be a 1.6 & torque-tuned. As in by upsizing the pistons in favor of stroke. If you upsize the pistons you increase the bore, not the stroke. I think it will also depend on the particular engine, though for hp, bore is the way to go. With the new 30dp 70loan, 2.0 Gogogo..